This story was updated at2:12 p.m. EDT. CAPE CANAVERAL, Fla. ? NASA is counting down toward thefinal flight of space shuttle Discovery after engineers successfully repairedtwo minor gas leaks on the spacecraft in time for one last launch on Wednesday(Nov. 3). 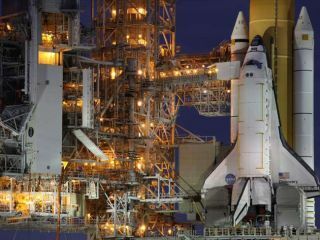 Discovery's final launch has been delayed two days due to leakyhelium and nitrogen seals found in the shuttle's right orbital maneuveringsystem pod last week. Technicians raced to troubleshoot the problem andre-pressurize the orbiter's rocket engine in time for a targeted launch at 3:52p.m. EDT (1952 GMT) on Wednesday. The official countdown toward liftoff begantoday (Oct. 31) at 2 p.m. EDT (1800 GMT). "Work is on schedule," NASA test director StevePayne told reporters in a status briefing this morning. "We completedflight pressurization ? all went well. That is behind us now." The weather forecast for Wednesday's launch calls for a 70percent chance of acceptable conditions at the launch site, according to KathyWinters, NASA's shuttle weather officer. The only major weather threats forlaunch are low clouds and a chance of isolated showers near the launch pad. "She's been an incrediblevehicle," Payne said. "She's always amazed us with everything shecan do, and we expect this flight will be no different." While the weather outlook for Wednesday looks promising,NASA is tracking some other storms that could stall Discovery's flight if itsuffers another launch delay. A weather front pushing down into parts of central Floridathat could cause concerns if Discovery's launch is stalled another 24 hours ormore, Winters said. This incoming weather system could prohibit launch due toshowers and even thunderstorms in the area, Winters said. Under thesecircumstances, forecasts currently estimate a 60 percent chance of favorableconditions if NASA officials were to delay the launch by 24 hours. NASA has until Sunday, Nov. 7 to launch Discovery toward theInternational Space Station launch within the current window. After that, thespace agency would have to wait until early December to try again.